A challenge faced by many facilitators is to gain agreement in groups. We recently explored some options to use to gain agreement in groups. Often, groups get stuck on what they disagree on and can’t move forward (e.g. in a strategic planning workshop). A strategy that was worked for me is to use an adapted version of Sam Kaner’s ‘Gradients of Agreement’ model. Step 1. Help the group to clearly articulate the issue (e.g. 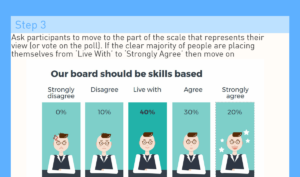 Our Board should be skills based rather than representative based). Step 5. If there are people placing themselves at ‘Strongly Disagree’ or ‘Disagree’ points, ask them to explain what they don’t like about the proposal. Clarify areas of disagreement. Discuss with group and find out what could be changed to get those disagreeing to shift. Otherwise, get them to propose an alternative. The key part here is to ensure those in disagreement are heard, their reasoning is better understood and there is clarity regarding how well the option is supported.